Supreme Court nominee Merrick Garland and Chief Justice John Roberts haven't always agreed. Take the case of the "hapless toad." It has become one of the better-known conservation decisions of both judges and demonstrates divergent opinions about the reach of environmental protections. The disagreement over how to handle the toad case arose when the pair served on the U.S. Court of Appeals for the District of Columbia Circuit; they could become colleagues again if the Senate confirms Garland to the high court. 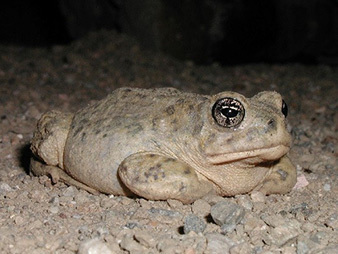 At the center of the legal battle was the arroyo southwestern toad, an endangered species found exclusively in California and northern Mexico. The Fish and Wildlife Service in 2000 rejected a real estate development slated for San Diego County, finding that it was likely to jeopardize the toads' existence. The developers sued the Interior Department in the D.C. Circuit, arguing that the application of the Endangered Species Act to their construction plans exceeded federal power under the Constitution's Commerce Clause, which allows the government to regulate interstate commerce. Arroyo southwestern toad. Photo courtesy of the Fish and Wildlife Service. Garland sided with the federal regulators, writing the court's unanimous opinion that upheld the protections. The developer's case represents a set of circumstances "under which the ESA may constitutionally be applied -- even to the lowly arroyo toad," Garland wrote in April 2003. The developer, Rancho Viejo LLC, asked the full D.C. Circuit to reconsider. The court refused in July 2003, about two months after then-D.C. Circuit Judge Roberts had been appointed by President George W. Bush. But Roberts penned a dissent, arguing that the full court should hear the developers' appeal and referring to the species as "a hapless toad that, for reasons of its own, lives its entire life in California." Roberts' "hapless toad" remark worried some environmental advocates, including California Democratic Sen. Dianne Feinstein, who said at Roberts' Supreme Court confirmation hearing, "There is a great deal of concern as what this then means for the implication for all environmental law -- the Clean Water Act, the Clean Air Act." Also during that confirmation hearing, Roberts expressed respect for his then-colleague Garland. When asked about a different case in which Roberts and Garland had opposed each other, Roberts said, "Anytime Judge Garland disagrees, you know you're in a difficult area. ... But Judge Garland disagreed, and so it's obviously to me a case on which reasonable judges can disagree." The toad case is one of many in which Garland has upheld government regulations, earning him a reputation as a judge who's willing to defer to federal agencies' expertise. Last year, for example, Garland was among the judges who rejected a series of challenges from states, environmental groups and energy companies to U.S. EPA's determinations of which parts of the country meet its standard for ozone, a main component of smog (Greenwire, June 2, 2015). He also recently favored upholding the Obama administration's mercury and air toxics standards for power plants in a case that went to the Supreme Court. The high court, in an opinion authored by the late Justice Antonin Scalia, rejected the mercury rules. Still, Garland hasn't always deferred to agencies' policies. He was on a judicial panel in 2009 that sent a George W. Bush administration rule setting standards for airborne soot and dust back to EPA for review. In that case, the judges found that EPA's 2006 standards for fine particulate matter were, "in several respects, contrary to law and unsupported by adequately reasoned decisionmaking" (Greenwire, Feb. 24, 2009). Garland's opinion in that case "demonstrates that he will not ... allow EPA to ignore science when doing so would harm public health," Ann Carlson, an environmental law professor at the University of California, Los Angeles, wrote yesterday in a blog post. Another important opinion from Garland came in 2002, Carlson noted, when he dissented from an opinion that threw out EPA rules for reducing haze in national parks after industry groups challenged the regulations (Greenwire, May 28, 2002). To Carlson, that decision seems "highly relevant" for pending litigation over the Obama administration's Clean Power Plan -- which could ultimately wind up at the Supreme Court. Both cases involve challenges to how EPA interprets the definition of "sources" of air pollution regulated under the Clean Air Act, Carlson said. So Garland's rationale in the haze case "is important in signaling that he is likely to defer to EPA's judgment about the best way to regulate sources" under the Clean Power Plan. Scholars and politicians will continue to pore over Garland's record, and his environmental opinions will certainly be scrutinized if the Senate ever agrees to hold confirmation hearings. But overall, he "tends to be very deferential to regulatory agencies," said Case Western Reserve University School of Law professor Jonathan Adler. That's true both in terms of "the degree of scrutiny he provides to agency actions" and also when it comes to "constitutional claims about agency actions," as in the case of the hapless toad.